The Northwest Power and Conservation Council has approved construction of a $12-million Chinook hatchery on the Walla Walla River. The funding will expand a facility operated by the Umatilla Tribes that now traps and spawns returning spring Chinook to one that also raises and releases smolts. The approval came after the Independent Scientific Review Panel (ISRP) signed off in September on the scientific merit of the proposal after several years of wrangling with the Umatillas over the value of supplementation and questions of how suitable the Walla Walla River was for such a project. But achieving the ultimate goals of the program -- eventually producing several thousand spring Chinook for harvest by both tribal and non-tribal fishers, and developing a self-sustaining natural population -- may also require a major effort to restore habitat in the Walla Walla and Touchet rivers, estimated to cost $157 million over the next 10 years. The new facility will produce 500,000 yearling spring Chinook smolts annually for release into the Walla Walla River Basin, 400,000 into the South Fork of the Walla Walla and 100,000 into the Touchet River. The first fish are planned to be released in 2017 and adults should return in 2019. The tribes' proposal calls for developing a natural population of 1,100 spring Chinook, and a hatchery return of 2,750 that's based on a smolt-to-adult return rate of 0.55 percent -- goals the ISRP earlier said were not supportable from the limited empirical evidence. The panel had said the return rate was more optimistic than the rate used in planning Chinook reintroduction into the Hood River, and larger than seen in the Umatilla reintroduction work and initial work in the Walla Walla. In a 2012 presentation at the NPCC, Gary James, Umatilla fishery program manager, said the nine-year geometric mean for natural spawners was about 142 fish, and the six-year mean for returning hatchery adults was 288 fish. The best return occurred in 2010, after migrating smolts found exceptional ocean conditions in 2008 when they went to sea. About 1,200 fish returned to the Walla Walla that year, and about 80 percent were hatchery fish. James said current smolt-to-adult return rates were about 0.24 percent. That's less than half the SAR projected for future operations. After a three-year running average of returning hatchery and wild fish reaches more than 1,000 fish, the second phase of the proposal will begin, with the transition to an integrated harvest program. When natural-origin adults reach a three-year running average of more than 750 fish, and a 5,500-fish total, the third phase will begin after proposed improvements to the basin are expected to be completed and provide returning fish with enough habitat to maintain themselves. It was reported that BPA has not approved the $157 million in estimated restoration funding for the Walla Walla subbasin, and some say this amount is wishful thinking, but costs might actually be considerably lower than that, with much emphasis on improving spawning and rearing conditions in the Mill Creek area. 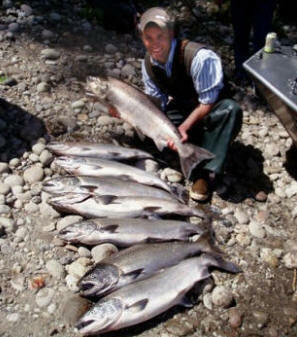 When natural-origin returns of spring Chinook average 5,000 (five-year geometric mean), then smolt releases would be terminated at the Walla Walla facility. That 5,000-fish goal may also be wishful thinking, since the stock being used to build up the population is a mixture of Columbia Basin fish called the Carson stock. It was originally derived from about 500 spring Chinook salmon, a mix of upper Columbia and Snake fish, trapped annually from 1955 through 1964 at Bonneville Dam on the Washington side of the Columbia River, then moved to holding ponds at the Carson Hatchery. Since then, the Carson stock has been used throughout the basin, with mixed success. In places like the Methow and Grande Ronde rivers, it has been phased out because of its low productivity and non-native, non-ESU status. But the remnants -- a Carson/Methow composite -- will be used to reintroduce Chinook into the Okanogan. Genetically, it's about 40-percent Carson origin. The Carson fish were used to help reintroduce spring Chinook in the Umatilla River. About 50,000 spring Chinook smolts from the Carson hatchery are used in a program in the Hood River, but most are released on site, more than one million smolts every spring. Carson lineage fish are still being used to produce fish for harvest at the USFWS facility at Leavenworth in the Wenatchee subbasin, and the new Colville Hatchery below Chief Joseph Dam on the Columbia is expected to release about 900,000 Carson stock spring Chinook smolts every year for future harvest opportunities. In its latest review, the ISRP asked if the Carson stock was the most appropriate one to use for the project. The panel had other issues as well, pointing out that "weak adult returns and low SAR values in 2011 and 2012 (about 0.23, well below the 0.31 value assumed for Phase 1) from previous experimental hatchery releases indicate that it may not be easy to meet program goals with artificial production (especially production of a local stock, and ultimately, sustainable harvest from a local stock). These poor returns merely reinforce the perspective that this program needs to be undertaken in an experimental fashion and with rigorous measurement and evaluation of benchmark indicators."